Suitable for diesel vehicles and diesel engines of all kinds: Cars, SUVs, vans, trucks, buses, tractors, agricultural machinery, construction machinery, generators, etc. In light of rising fuel prices and the climate change alternative fuels such as vegetable oil offer an economical and ecologically friendly alternative to conventional diesel fuel. Straight vegetable oils (e.g. rapeseed oil, canola oil, soya oil, sunflower oil, jatropha oil, coconut oil, palm oil) are CO2-neutral, sulfur free and nontoxic. In addition to pure plant oils, the use of used cooking oils is also possible, provided they are cleaned and free from water. Vegetable oils must not be confused with biodiesel (RME). Biodiesel is chemically processed and is much more expensive to produce. Compared to fossil diesel fuel the consumption and engine power with vegetable oil remains nearly the same. Pure vegetable oils or used cooking oils have a significantly higher viscosity and ignition temperature than diesel fuel and must therefore be heated to operate diesel engines. Unheated vegetable oils lead to starting difficulties and have a negative effect on the performance and service life of the engine. Cold, viscous vegetable oil strains the injection system and burns incompletely. In the long term, unburnt fuel residues can lead to carbonized injectors and deposits in the combustion chamber of the engine. At last for a long-term and smooth operation with vegetable oil the conversion of the engine is imperative. 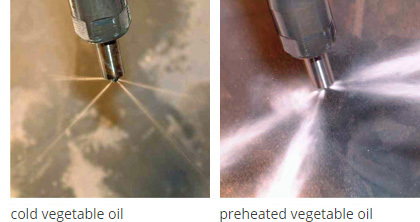 The ATG VEGETABLE OIL CONVERSION SYSTEM (2-tank-system with fuel preheating) is a well proven solution for the operation of diesel engines with untreated vegetable oils. The additional fuel tank is available in various shapes and sizes (see fuel tanks) and can be installed at any suitable location. The electric switching unit is used to switch between the fuel tanks and for flushing the fuel system. In order to protect the cold engine and the injection system, the cold start is generally done with diesel fuel. As soon as the engine reaches its operating temperature, it will be switched automatically to vegetable oil. There is a soft transition from diesel to vegetable oil. The heat exchanger (fitted in cooling water circuit) heats in combination with the electric fuel preheater the vegetable oil to an optimum temperature. The heated fuel relieves the injection system and is finer atomized by the injectors. It ignites and burns more efficiently, resulting in fuel savings and less wear and tear on the engine. As long as the motor has its operating temperature, it can be stopped and restarted in vegetable mode. Only when the engine is switched off for more than an hour, it should be switched back over to diesel mode before the end of operation. An automatically activated quick purge flushes the fuel and injection system shortly with diesel fuel and ensures a cold start without any problems. To prevent an unintended engine stop a short audio warning reminds to switch back to diesel when the engine is switched off in vegetable oil mode. The ATG VEGETABLE OIL CONVERSION SYSTEM is available as 12 and 24 volt version for various engine performance classes (up to 50 kW, 75 kW, 150 kW, 250 kW, 500 kW, 1 MW). With over 20 years of experience, ATG is a leading supplier in the field of vegetable oil conversion. In the meantime, around 10,000 diesel engines and vehicels of all kind have been retrofitted with the proven and tested ATG VEGETABLE OIL CONVERSION SYSTEM. Thereof approx. Can my engine/vehicle be converted with the converison system? The ATG VEGETABLE OIL CONVERSION SYSTEM is suitable for diesel engines with in-line or distributor pump from Bosch, Diesel-Kiki, Nippon-Denso or Zexel. The conversion of diesel engines with high-pressure injection systems such as pump-nozzle/unit-injector or common-rail injection technology is only possible via ATG and its partners. The size of the additional fuel tank (see fuel tanks) depends on the vehicle type and the available space. If you have any further questions regarding a conversion, please do not hesitate to contact us. Where can I order a conversion kit? 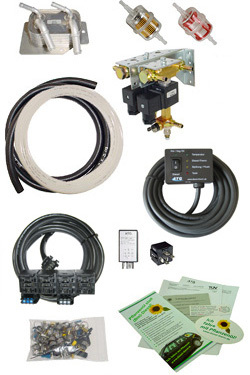 The ATG VEGETABLE OIL CONVERSION SYSTEM is available directly from ATG or ATG partners. Where can I have my vehicle converted? The conversion can be carried out by an ATG partner or from any motor vehicle workshop. Technical skill and understanding for diesel engines are presumed, a DIY (do-it-yourself) conversion with the enclosed installation manual is also possible. For your own protection, please check with the appropriate authorities in your country if there are any specific provisions concerning changes on the vehicle. No, the original condition, for example, when the vehicle is sold, can be easily restored, since no modifications are made to the engine and relevant vehicle parts. All components can be reused in case of a vehicle change. Are there any long-term studies on the operation of diesel engines with vegetable oil? It is known through tests and studies that heated vegetable oil is very close to the properties of diesel fuel and therefore burns just as well and effectively. On the strength of past experience almost every diesel engine can be operated with straight vegetable oil after a conversion, provided that the motor is maintained and technically in perfect condition (compression, fuel injectors, glow plugs, …). Can I use vegetable oil in winter or at minus temperatures? Pure, untreated vegetable oil becomes viscous and sticky at freezing temperatures. Depending on the type and properties of the vegetable oil, this condition occurs sooner or later. In order to prevent the vegetable oil from gelling in the tank or fuel lines, a mixture of vegetable oil and normal diesel fuel is recommended during winter months. Due to the 2-tank-system, in case of extreme cold a pure diesel operation is temporarily possible. How does vegetable oil effect the properties of the engines? As a rule, the engine properties (operation, performance, consumption, …) remain unchanged. Can parking heaters be operated with vegetable oil? Parking heaters are not suitable for the operation with vegetable oil. Thanks to the 2-tank-system, parking heaters can still be operated with diesel. How expensive is vegetable oil and where can I get it? Vegetable oil is a natural product and an inexpensive alternative to conventional diesel fuel. In many countries vegetable oil is not subject to a mineral oil tax. Smaller quantities of vegetable oil can be purchased in any supermarket or wholesale store. In the long term, it is more preferable to purchase vegetable oil from local suppliers (e.g. oil mills). Recycled or used vegetable oil (WVO waste vegetable oil / UCO used cooking oil) can also be used provided that it has been cleaned/filtered to at least 1 µm (mircon) and is free from water. Is it generally permitted to use vegetable oil as fuel? For your own protection, please check with the appropriate authorities in your country if there are specific provisions prohibiting the use of vegetable oil. This is also to be done for any changes on the engine or vehicle to be converted. What is the difference between vegetable oil and biodiesel? All natural biofuels, like plain vegetable oil are CO2-neutral and free of sulfur and pollutants in their pure, untreated state. 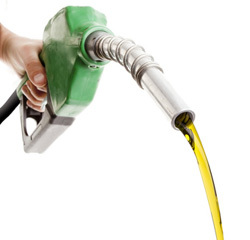 Biodiesel is chemically processed and more expensive than plain vegetable oil. The resistance of plastic and rubber parts (seals) that come into contact with biodiesel is a problem. If biodiesel is used in non-adapted systems, leaks in the fuel system and defects in the injection system are the most frequently troubles. When using pure, untreated vegetable oil, these problems do not occur.